Most people who consume a lot of drinks like coffee, tea, and fizzy that contain high amounts of caffeine may become addicted and find it hard to cut-back or stop completely. In some cases, reduction or complete elimination of caffeine from a person’s diet may result in caffeine withdrawal symptoms. Although, some of the symptoms are said to be milder, others are considered a health disorder. Some studies have found that individuals may even experience severe withdrawal symptoms capable of preventing them from working. Typically, when you consume more caffeine, you stand a higher chance of experiencing caffeine withdrawal symptoms. Symptoms usually begin from about 12 to 14 hours after the consumption of caffeine has stopped. The symptom effect is however at its peak after 24 to 48 hours and can persist for as long as nine days. So what then are the signs of Caffeine Withdrawal Symptoms? To reduce or eliminate caffeine from your diet completely, it is advisable to cut-back slowly to avoid withdrawal symptoms. Quitting suddenly may worsen the withdrawal symptoms. If you are addicted to drinking several cups of coffee each day, then, try to cut down to just a cup per day. This approach is less aggressive. Also, try to switch to decaffeinated or a coffee substitute. For those who may be addicted to tea, they can also reduce caffeine intake slowly by opting for decaffeinated tea or better yet herbal tea. If fizzy drinks like colas are your caffeine vice, then you should reduce consumption slowly by first taking smaller bottles, then drawing back daily intake. Overall, learning how to cut down caffeine intake slowly is the best way to wean you off caffeine gradually. Pregnant women especially may suffer from increased risks of miscarriage, stillbirth, premature delivery, or even lower birth weight. How To Fight the symptoms? To avoid withdrawal, reduce your daily caffeine intake. Gradually start reducing the caffeine content of your beverages; you can switch to half-caffeinated or decaffeinated tea or coffee before stopping altogether. You can also use a coffee alternative in as a replacement or as an additive to reduce caffeine levels. To boost your energy without having to consume caffeine, then go for a long walk, run, or do a quick workout. Here’s Why Coffee Can Contribute to Acne Based on Research. For decades now dermatologists and nutritionists have debated whether our diet and drinks play a part in most cases of acne. Part of the growing interest about the effects of stimulants especially coffee on acne is largely due to the observations reported by the American Osteopathic College of Dermatology. Doctors working among remote jungle tribes observed that acne literally does not affect the natives. We take a closer look at what several research sources say below. Coffee and Acne: What Does Research Say? It’s common knowledge that a major component of coffee is caffeine. Although caffeine also exists in many other forms of beverages such as some brands of tea and soda drinks, the caffeine in coffee is particularly acidic. Even decaf coffee has caffeine, sometimes as much as 20mg per 12oz cup. Well, acidic foods (acid-forming foods) are a category of foods that reduce the pH of the body to below 7. When this happens, it’s a key trigger of stress and inflammation in the human body, and this manifests in several ways. In the context of coffee, inflammation is a direct contributor to cystic acne. A type of acne that penetrates deeply into the skin causing those dreaded pus-filled pimples. One study published by the US National Library of Medicine National Institutes of Health shows that caffeine increased the epinephrine (adrenaline) levels in even normal healthy subjects by up to 32%. 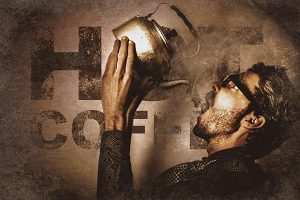 Furthermore, long-time caffeine researcher James D. Lane a professor of medical psychology at Duke University, Durham confirms that caffeine does indeed exaggerate the stress response. American nutritionist Paula Simpson also adds her voice to the debate about how coffee can help clog up your facial pores. She says that the fallout of elevated stress levels – triggered by coffee consumption among other things – is that it flares up your sympathetic nervous system thereby pumping out excess stress hormones. Cortisol is one of these hormones, and the large cortisol spike people get from consuming coffee is what gives them so much energy for some hours afterward. 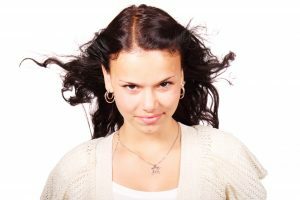 But at elevated levels, cortisol can increase the skin’s oil production and eventually result in acne and other breakouts. In fact, increased cortisol levels in both male and female subjects is one of caffeine’s most notorious side effects. Of course, the caffeine in coffee also disrupts the normal sleep patterns further elevating stress levels. Consequently, a sustained level of elevated stress hormones will upset the body’s insulin balance, cause higher sebum production, affect the skin repair process, and the vicious acne cycle continues. Another way coffee and acne are linked is through the “leaky gut syndrome.” A person suffering from leaky gut has high acidity in their digestive tract. This acidic condition disrupts the natural balance in the stomach and allows bad bacteria to flourish. With time, the junctions in their intestinal lining will weaken and break and interfere with nutrient absorption causing inflammation in their guts. People experiencing leaky gut are especially sensitive to some particular foods, and they will notice acne flare-ups not too long after they consume such items. Again, coffee is one such think to avoid. In addition, these kind of foods inhibits your body cells’ ability to repair themselves, another factor that decreases how quickly skin heals from acne. The gut-skin-brain axis is a new area of research that has found much promise and is currently undergoing several studies and clinical trials. 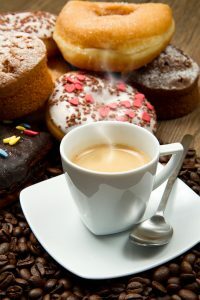 There is still a lot of research going on about the connection between coffee and acne, but it’s clear that coffee (caffeine) can exacerbate acne though the severity will vary from one person to the other. If you need to kick the caffeine habit there are many alternatives to coffee that taste just as delicious and can provide the necessary energy to get moving. There are many possible reasons why you might need to stop coffee, including stress, anxiety or a medical condition that requires you to completely cut out caffeine. One of the most common health conditions coffee exacerbates is acid reflux (GERD). Coffee is actually fairly acidic and can cause issues for those predisposed to problems with stomach acid. Other issues include weight gain. Researchers found that too much coffee, including decaffeinated, resulted in a change in the utilization of fat in the liver and caused abnormal retention of fat within cells. This resulted in a higher degree of glucose intolerance and increased insulin resistance. Caffeine can also stimulate cortisol which leads to more stress and binge eating. Typically if you suffer from high blood pressure, sleep issues, headaches or bladder issues your doctor will tell you to cut out coffee. Regardless of your reasons, there are other alternatives to that cup of morning joe. Decaf coffee isn’t totally decaffeinated and is actually more acidic than regular coffee. On top of that because of the extraction process using somewhat unsavory chemicals like methylene chloride, a base for paint strippers, and ethyl acetate, a dry cleaning fluid – it just doesn’t taste as good. There are options out there that are even preferred over a cup of Colombian roast. Here’s a full list of all the alternatives to coffee and the health benefits. As you look at different alternatives make sure to look deep in the label. What are the benefits of the ingredients? Does it have added sugar? Does it use any chemical processes to extract the ingredients the way decaf does? Finding a substitute that is right for you requires some trial and error. Some coffee substitutes are sweeter while others have that more dark rich flavor that traditional coffee drinkers love. Most coffee substitutes can be mixed with regular coffee if your goal is to not cut out coffee completely but rather to supplement and lower your caffeine intake. Check out our caffeine calculator to see whether you’re getting too much caffeine. You might find that you are exceptionally sensitive to caffeine, in which case even the slightest amount may make your heart race. In such a fast paced world it’s easy to get addicted to something that helps boost energy levels in the short-term. But it’s more of a roller coaster ride as blood sugar increases and energy drops back down, with all sorts of other effects like increased stress, anxiety and less sleep. Caffeine addiction may be mild but it’s real for many people who try to stop all of a sudden. Each cup of coffee or caffeinated beverage causes a release of the adrenal glands and it impersonates a chemical that helps us stay feeling relaxed called adenosine. Too much regular coffee usage can result in a state of exhaustion, making you more and more tired and taking more coffee to get the desired effect. This is when your adrenal glands have been truly depleted. Quitting coffee usually only produces mild symptoms but they can be quite disruptive. Headaches are common since caffeine constricts the blood levels in the brain (that’s why you see caffeine in so many headache medicines). Of course caffeine can also cause headaches. It’s best to avoid excessive excess sugar as this can exacerbate the symptoms. A little extra sleep will do wonders to help your body recharge and get back in order. If you’re a regular coffee drinker you don’t need to quit all at once. It’s recommended to first cut out any coffee or caffeine ingestion after 2PM. You can supplement with Ramon seeds, Teeccino or Malero coffee alternatives. Once you’ve acclimated to the reduced coffee intake and gotten some more rest reduce another cup by using your favorite coffee substitute. You can also mix coffee substitutes with your regular coffee in order to reduce the dosage, this method is preferred by most since they still get some coffee kick and caffeine but at reduced levels. After a period of weeks your body will acclimate and you’ll no longer crave coffee in order to function about your day. You’ll have more energy, be able to sleep more soundly and be more productive. Coffee and especially its key ingredient caffeine have been shown to lead to weight gain in several studies. One from the Western Australian Institute for Medical Research wasn't even looking into weight changes but came upon it in their data. They found that too much coffee, including decaffeinated, resulted in a change in the utilization of fat in the liver and caused abnormal retention of fat within cells. This resulted in a higher degree of glucose intolerance and increased insulin resistance. Caffeine in particular has been known to stimulate cortisol production. 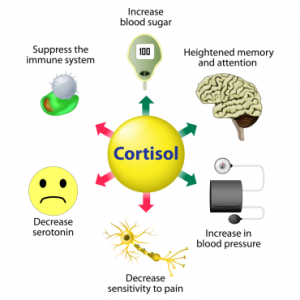 Cortisol is the stress hormone that was originally designed to give us a jolt to face a danger or stressful situation. This helped to save us from an imminent physical threat. Cortisol serves another purpose in that it promotes the release of insulin which we need to move glucose into our cells. When you have a stressful period you typically feel an increased hunger, because cortisol is creating a run on blood sugar. What's most surprising is that caffeine is included as an ingredient in many weight loss aids. While it may temporarily result in some benefit as it stimulants the nervous system and may increase metabolism, that effect is temporary and negated by the increase in cortisol and increased fat retention. For those that consume coffee after 2pm it may lead to decreased sleep, less sleep can lead to increased cortisol levels which would result in more eating. Caffeine can induce hypoglycemia. It's thought this is because it impairs glucose metabolism. Glucose is a very critical source of energy for cells the body constantly works to keep the fuel flowing and within a normal range so you feel good and can continue on. When hypoglycemia comes on it results in headaches, fatigue, mood changes and a beating heart. Caffeine inhibits the release of GABA, which keeps us alert and is used by our body to communicate between nerve cells. When GABA is low it can result in anxiety and mood disorders. On its own a cup of coffee only has a handful of calories but many prefer to add, cream, sugar and milk - this can easily add 100 calories. In fact, a latte can easily have as many calories as a piece of pizza as it's loaded with milk and sugar. Because of all these reasons many people have found that after quitting a long regular use of caffeine they experience weight loss.